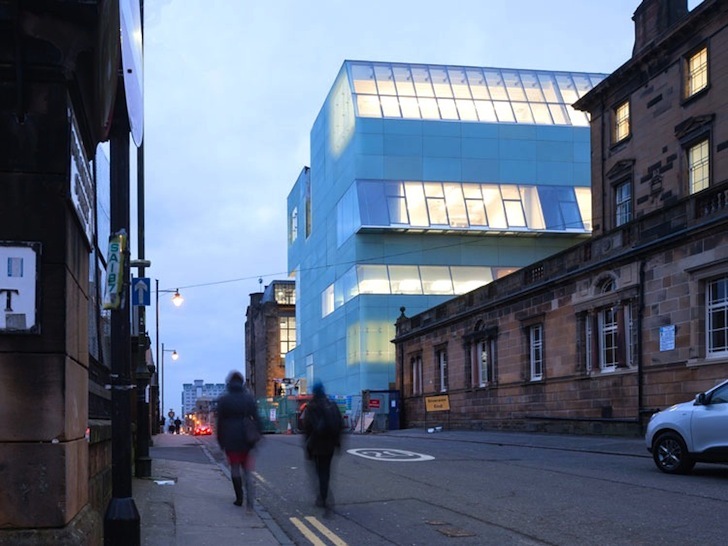 New York-based Steven Holl Architects recently completed the Reid Building, a modern and light-filled structure at the Glasgow School of Art that's nothing short of stunning - but it has left some critics less than satisfied. As an extension to Charles Rennie Mackintosh's architectural masterpiece, the Reid Building holds the unenviable position of being constantly compared to its prestigious century-old neighbor. Rather than replicate the styles of Mackintosh, Steven Holl designed the Reid Building in "complementary contrast" to the art school building opposite. Designed in collaboration with JM Architects, the Reid Building aims to forge “a symbiotic relation with Mackintosh in which each structure heightens the integral qualities of the other.” In contrast to Mackintosh’s sculptural sandstone masonry, the Reid Building is wrapped in a cloudy skin of translucent glass. The icy glass facade gives the structure a sculptural effect and brings in generous amounts of natural light. An external terrace on the south side will be planted in the style of Machair (the Scottish grassy plains). The concrete interior is painted white to capture and reflect the abundance of natural light. Three angled cylindrical chasms–or “driven voids light”–slice through the structure from the roof to the basement, opening up the building to southern light and providing a “circuit of connection.” While the “driven void” light shafts ensure that the building is well lit, they run the risk of doubling as disruptive echo chambers that amplify and carry noise throughout the building. The spacious studios and workshops are located along the north end of the building to take advantage of the northern light coveted by artists. The Reid Building accommodates the Glasgow's School of Art expanded design department. 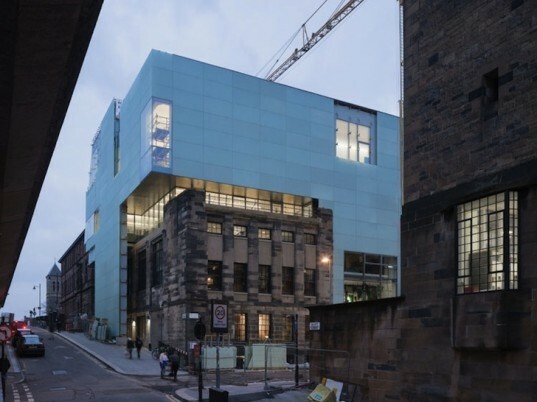 As an extension to Charles Rennie Mackintosh's architectural masterpiece, the Glasgow School of Art, the Reid Building holds the unenviable position of being compared to its prestigious, century-old neighbor. Steven Holl designed the Reid Building in "complementary contrast" to the art school building opposite. Designed in collaboration with JM Architects, the Reid Building aims to forge "a symbiotic relation with Mackintosh in which each structure heightens the integral qualities of the other." The concrete interior is painted white to capture and reflect the abundance of natural light. Three angled cylindrical chasms--or "driven voids light"--slice through the structure from the roof to the basement, opening up the building to southern light. Ramps and stairs wrap around the cylindrical columns of light to create a "circuit of connection." While the "driven void" light shafts ensure that the building is well lit, they run the risk of doubling as disruptive echo chambers that amplify and carry noise throughout the building. The spacious studios and workshops are located along the north end of the building to take advantage of the northern light coveted by artists.